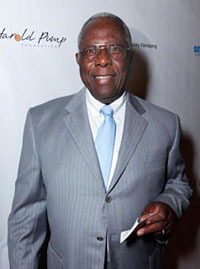 Of all the accolades bestowed on Henry Aaron since he retired from baseball nearly 35 years ago, the Harold Pump Foundation “Lifetime Achievement” award on August 12, was among the most meaningful for the man who has continued to use his celebrity and humanitarian achievements to improve the game of baseball and the community at-large. 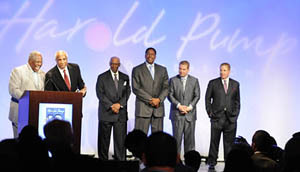 As Aaron addressed attendees of the “Harold Pump Foundation” gala with longtime friends and fellow 500HRC members “Mr. Cub” Ernie Banks and Frank Robinson at his side, he fondly spoke of how genuinely competitive he was with his contemporaries. “I was just as fast as Willie (Mays), he only looked faster because he fixed his cap so loose, it would fly off his head as he ran the bases,” Hank quipped. Born in Mobile, Alabama, on February 5, 1934, Hank Aaron rewrote baseball’s hitting record book during his 23-year career (1954 – ‘76) and he still holds more Major League batting records than any other player. His most famous home run came on April 8, 1974, when he hit his 715th, breaking Babe Ruth’s seemingly untouchable record before a sellout crowd of 53,775. Aaron was almost unanimously elected to Baseball’s Hall of Fame in January of 1983 and has received numerous humanitarian awards including a lifetime achievement award, and the creation of the “Hank Aaron Award”, which was announced at his 65th birthday celebration in Atlanta on February 5, 1999 by dignitaries including President Clinton, the Commissioner of Baseball Bud Selig, and Sammy Sosa. About the Harold Pump Foundation - founded in 1999 by influential sports consultants Dana and David Pump, along with their mother Carole, the Harold Pump Foundation is dedicated to raising funds for the treatment and cure of cancer. Created to honor their late father, who had lost his fight with cancer in the same year, The Harold Pump Foundation seeks to raise funds to combat cancer by creating awareness, establishing treatment programs, and helping to find a cure.